I don’t like it when election campaigns go negative and although I’ve received more than my fair share of personal attacks from opponents over the years, I’ve never been the first to make an attack on my opponents. I prefer a clean fight; and debates based on facts. Facts matter. That’s why I was so gobsmacked by the bare-faced cheek of this post by the Liberal Democrat candidate for my ward of Westhoughton North and Chew Moor. She posted this on her political Facebook page. I still can’t believe she did but there you go. Its always interesting to see how the Lib Dems try to spin these things. I sit on the Planning Committee as a Member appointed from the Conservative Group and I was present at the meeting yesterday where this application was discussed. 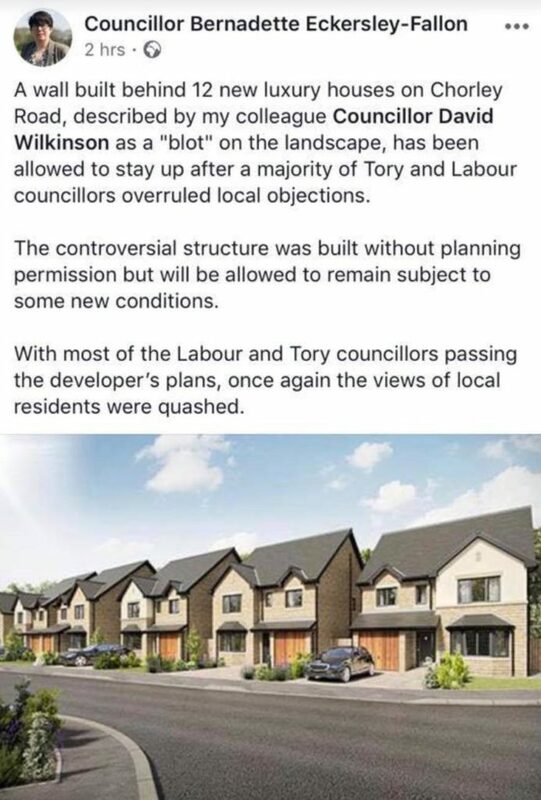 I have also been involved with issues surrounding this development since the first application came in to build the houses; so I am intimately familiar with it. I’ve never seen the Lib Dem candidate on the site, either during the original application process or at any meeting I’ve had to revolve the numerous problems that have resulted from this development. That made her post, as shown, all the more shocking. But let’s break this post down into the base facts, and address each point one by one. The application is not about the houses, despite the picture showing only houses. The application was for a retaining wall at the rear of the development, plus electric gates at the front. The idea is to shore up the raised land and create a gated community; neither of which were part of the original plans when the development was passed, although solving the land levels issue was delegated to planning officers. When the application for the houses was heard (a long time ago, now), I brought the application to the Committee and spoke against the development. The Lib Dem candidate did not speak against the housing when I brought that application to the committee, even though she could have. Members of the public can attend Planning Committee meetings, register their interest and notify the officers of their wish to speak on an application at the door. It’s a very simple process. The application heard yesterday was jointly brought to the Planning Committee by myself and Cllr Christine Wild. We are both Conservative Councillors representing Westhoughton North and Chew Moor. Cllr Wild and myself both spoke against the application; she having registered her wish to speak (in the same way the Lib Dem candidate could, as I explained above) and I as a member of the Planning Committee. I moved that the application be Refused. This was backed by Cllr Anna-Marie Watters (a Labour Councillor for Westhoughton South). All Westhoughton Councillors on the Planning Committee voted against the application. Facts matter more than cheap shot, misleading posts. I work hard for Westhoughton North and Chew Moor. I fight every development on our Green Belt, which this one was; and where members of the public ask for my help with a planning application, I give it. In this instance, I fought overdevelopment on the green belt and I worked hard with members of the public to resolve their planning issues surrounding this development. It has been a long and difficult process and I don’t see that ending any time soon. Cheap shot attacks from the Lib Dems don’t make this easier for anyone; and they certainly don’t speak well to the character of the person posting them.